After 10 years I ended the monthly version of my show, THE ROMANE EVENT. One of the most spectacular feelings I have ever had was saying goodnight for the last time at The Romane Event and watching as the entire crowd of 100 plus stood for a standing ovation. I couldn’t even talk. One of my proudest moments! Just incredible. After 10 years, 100’s of shows and 100’s of performers my Grand Hiatus show was one of the best I have ever had. And the crowd’s reaction meant that they have been thoroughly entertained over the years as well. I’m also really proud of these recent articles, in the SF Bay Guardian and NBC Bay Area about my last monthly The Romane Event Comedy Show. The Last Laugh indeed! Lots of people asked me why I ended my run when it’s still really popular and firmly sewn into the SF culture. But that is precisely when it’s the time to move on. At the top and not while a “once was”. I started The Romane Event because I love comedy and found out that I love producing too. What I never expected is that the show would get more and more popular with each year and that some of the comedians I would give stage time to would go on to be big names in comedy (Moshe Kasher, W Kamau Bell, Emily Heller, Ali Wong, Sheng Wang, Chris Garcia, Brent Weinbach, Tim Lee, to name a few). I used to stand at the end of the bar with Dj Specific and wonder if anyone was going to show up. Including the comedians! What’s interesting to me is that I started performing stand up because of the Romane Event. 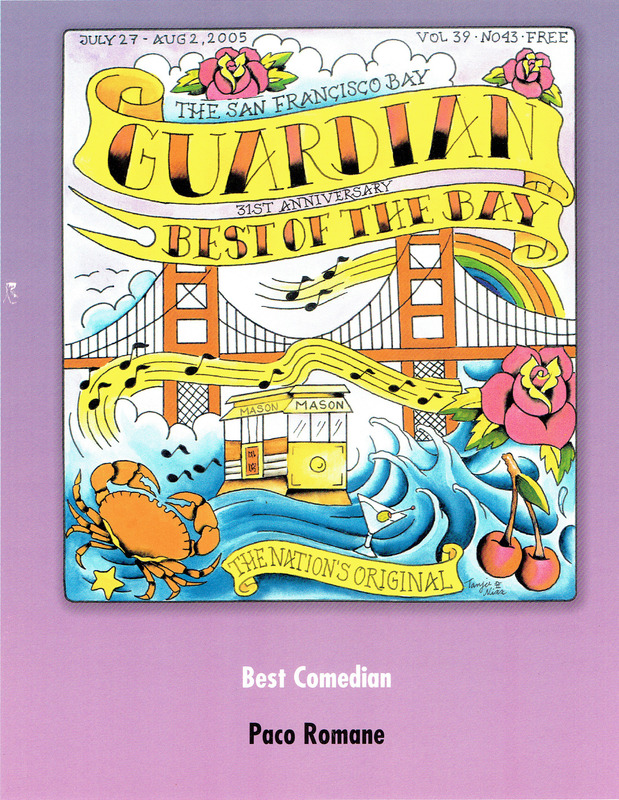 In the beginning I just hosted and did some sketches and characters but in 2005 I won “Best Comedian” in the San Francisco Bay Guardian and people would come by to see me do stand up. Needless to say I had to learn to do stand up quickly. And as I easily demonstrated no one learns how to do stand up quickly. The show started out as a pure variety show. I have had famed cartoonists (Dan Piraro) Yo-Yo champions (Dr. Popular), musicians (Sean Hayes), sketch comedy (Killing My Lobster), one man sketch comedy (Will Franken), movies (FreeDirt Media), improv groups (Big City Improv), and countless stand up comedians. 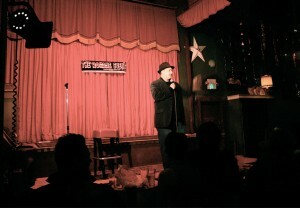 I have had national touring comedians stop by, comedians from other countries (Canada, Australia, Germany, Japan, South Africa), up-and-coming local comedians and comedians that have since retired. One of the things The Romane Event was especially known for was the diverse but really talented acts you could see. I love producing shows with a diverse line-up and knowing that each comedian will compliment each other in the line-up. But in the end, for me, it was always about the audience. Without an audience you can’t have a show and their entertainment must come first when producing any show. You want the audience to leave your show wanting to come back to see another, to tell their roommates about the show or even brag about seeing it. After every show I would thank every audience member for coming out. I wanted to show them the respect they deserved for leaving work, or the comfort of their home and coming out to the Mission in SF to see a comedy show in a bar with bedazzled deer heads and decorations left over from an ‘80’s prom. Respect and thanks for the love! Pictures: Romane Event 9 year anniversary and Grand Hiatus show!